Kayaking can be a fantastic activity at any age. And when it comes to kids, paddling from a young age can ignite a lifelong passion for kayaking and outdoor adventures. But how do you choose the best kayak for your little one? There are lots of things you’ll probably want to think about before you settle on a particular vessel for your kid. So we’ve put this guide together to help narrow down your search and answer any questions you might have. Is My Kid Ready To Paddle? You will likely know yourself when your kid is ready to paddle on their own. Taking your kids out in a tandem yak or having them sit in front of you in your own vessel can be a good way to introduce them to kayaking, before you set them loose in their own craft. This can also let you see how they might fare on their own, if they can gain a little experience paddling along with you. However, before your kids set sail on their own, it can be useful if they know how to swim, so they can swim to shore or re-enter their yak if they fall off. It might be a good idea to sign your kid up for a kayaking lesson before they get into their own boat. This can give them a taste of kayaking and can give both you and them an idea of whether or not they are ready for their own yak or if they’ll even enjoy it. Lessons can also help encourage kids into kayaking without pressure. It can also give more reluctant kids a chance to see other kids their age having fun on the water. Whether or not your kid is ready for their own vessel will likely depend on their size, maturity and physical abilities rather than their age. But if your child is around the age of seven it might be a good time for them to learn on their own in a small vessel. However, they should always be accompanied and supervised on the water by an experienced adult on any paddling trip. And if your child doesn’t want to go in their own boat, it’s probably best that you don’t force them or you might put them off ever trying again. What Type Of Kayak Would Be Good For My Little One? When you’re thinking about choosing the right kayak for your child, you will want to opt for one that’s going to be easy for your kid to learn in and therefore easy for them to maneuver on the water. The length of the craft will be important because if it’s too long your child may struggle to turn it, so a shorter length can be ideal. You will also find that with the shorter length, the yak should have more stability and be easier for a youngster to control. Generally, the wider the hull, the more stable the boat should be; compared to a narrower, longer one. But because most kids will tend to be smaller than adults, they may not need quite as wide a vessel as an adult beginner, as most kids will have a lower center of gravity compared to larger, taller adults. Many kids’ boats will tend to be smaller all around, so they will often be a good width for your child to easily paddle, but without compromising on stability, and have a short length that they can turn and control easily. It can also be a good idea to look at the weight guide on each individual kayak, as this can give you an idea of how suitable it will be for your child. Based on your child’s weight, this can also let you know if your kid will outgrow the vessel quickly or perhaps they might be a little too small to paddle it. The weight of the kayak may impact your decision too, as a child may struggle to paddle and maneuver a heavier boat. Lighter boats can be a better option and kids can often then help carry their vessel to and from the water. However, smaller kids will probably still struggle to lift even lightweight vessels, so it can be a good idea to factor this in, as you will often have to carry their vessel for them. A lot of yaks that are designed for children tend to be small, lightweight sit-on-tops. But it’s also possible to find small sit-inside boats that are designed for kids to learn in. Sit-on-tops can be a good option for kids who have never been in a kayak before, as they can be easier to get in and out of and may not feel quite as confined as a sit-inside. A sit-on-top can also give kids the freedom to jump on and off if they want to play in the water. The shape of the hull can be important when choosing kids’ kayaks, as different hull designs can have an effect on the stability. Flat hulls and more pontoon style hulls can provide good initial stability, known as primary stability, which can be ideal for kids on flat water. Wearing a PFD (Personal Flotation Device) is absolutely essential for children and in many areas it’s a legal requirement. It’s also important that you find the correct size of PFD for your child. Children must wear their PFD at all times while they’re on the water, whether they’re actively paddling or simply sitting along for the ride. If you’re planning to head off on a paddling trip, remember that your kids may not be able to paddle as far as you’d hoped. Schedule in rest stops along your route or choose a route that’s shorter, especially if it’s your kid’s first time on the water. As with any kind of trip with kids, make sure you bring along plenty of drinks and snacks and keep them accessible during the trip. Having tow ropes on board your yak can be beneficial at all times but can really come in handy when you’re paddling with kids. It can be a good idea to factor in that your child may decide half way into a paddling trip that they don’t want to paddle anymore. With tow ropes you can tow their yak behind yours and have them sit in with you, or simply tow them along until they’re ready to paddle again. Particularly with smaller kids, an adult size paddle may be too large and too difficult for a kid to hold and use. Paddles designed for kids will tend to be smaller and lighter so that small hands and arms can use them more effectively. 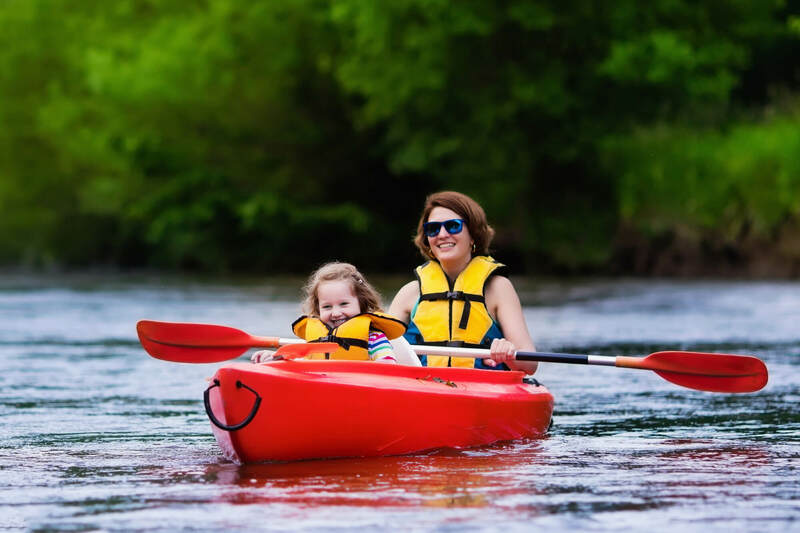 When taking your kids kayaking, especially for the first time, it can be a good idea to opt for calmer waters, such as a slow moving river or a calm lake, where there aren’t any hidden currents. Other boat traffic is another thing you might want to consider, so finding a quiet spot can help your kids get used to the water safely. No matter what type of water you’re taking your kids paddling on, it’s recommended that your kids are under adult supervision at all times. Preferably, your kids should be accompanied on the water by an adult who has paddling experience and kayak safety training. Even if the water is calm, it’s not advisable to leave your children unaccompanied or unsupervised. As with many activities, accidents can happen. The Lifetime Youth Wave is a 6 foot kayak that has been specially designed for children. It’s aimed at children from the age of five and is ideal for children up to 130 pounds, so you could potentially get a good few years out of it. It also has molded foot rests for different leg lengths, which can be useful as your child grows. It’s a durable sit-on-top with a Twin Fin design at the back of the hull, which aids in tracking, and a reverse chine hull that features channels running along the bottom of the hull to increase stability. A handy feature of this craft is the swim-up deck at the rear, which is designed to make it easier for kids to climb back on from the water. It’s a lightweight vessel crafted from UV protected polyethylene, meaning it’s durable and could be a good first kayak for a child. The Youth Wave also comes with a kid sized paddle included, which means your little one can get out on the water right away. The Emotion Sparky Youth Kayak could be a good option for your child’s first kayak. It’s a 6 foot sit-on-top that’s built for kids from the ages of five and up. With a 140 pound weight capacity, your kid could potentially get several years of use out of it, until they want something with a little more space for their longer legs. It benefits from an open seating area, with molded-in foot rests, and even has a small storage deck at the stern to let your kid carry along some essentials. There’s also a molded-in cup holder in the center of the cockpit, so your child can keep their water bottle within easy reach. The Emotion Sparky can be great for a range of waters, under supervision, from calm bays to lakes and even a day at the beach if the ocean is calm. It’s designed to be durable and stable, with a shallow V-shaped hull, and features a toggle handle at the bow as well as molded side handles. If you’re looking for a slightly larger kayak for your kids the Sun Dolphin Camino SS could be a good choice. It’s an 8 foot vessel that could be used by an older child and even an adult, and features a wide, stable hull for recreational paddling. It has a 225 pound weight capacity, so your kid could load it up with camping gear knowing the craft wouldn’t be over capacity. Because of the higher weight capacity and the 40 pound weight of the vessel, smaller kids might find it more difficult to paddle. The Camino SS features a sealed storage compartment in front of the seat as well as an open storage deck at the stern, with bungee cords to help secure larger items. This could make it a good yak for longer paddling trips or overnight adventures. The molded-in foot rests mean it can suit different sized paddlers and it also features a seat back that can be adjusted for a more comfortable time on the water. The Sevylor Quikpak K1 is an inflatable kayak that can be ideal for both children and adults and it can be easily deflated for storage and transportation. It folds into a backpack when deflated, which can make it easier to carry. However, smaller children may not be able to carry it easily or at all. It’s a wide, stable vessel that can be ideal for kids learning to paddle, but because of the length, it might be better suited to bigger kids. The Quikpak K1 is designed for one paddler and has a bungee storage area at the bow for holding gear and a drinks holder in front of the seat. It also benefits from front and rear carry handles, which could also be useful if you need to attach tow ropes. The craft is made from durable PVC with a tarpaulin bottom, for added protection against punctures. But it also features several air chambers that will keep the vessel afloat even in the event of a puncture. This portable little yak is ideal for a range of waters and comes complete with a hand pump and a paddle. 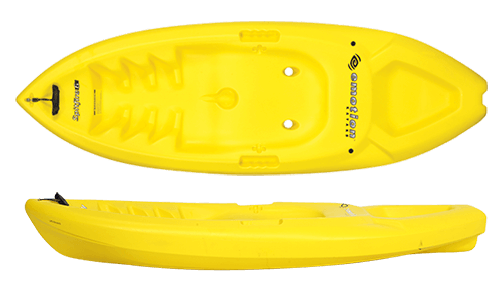 This Sun Dolphin Aruba SS is an 8 foot sit-inside kayak that could be great for kids, especially if your kids are looking to paddle in colder conditions. It’s a stable vessel designed for recreational use on lakes and rivers, which can make it ideal for family paddling trips. It has front and rear toggle handles to make it easy for two people to carry and the front toggle can also be used to attach a tow rope. There is a small bungee storage area at the rear, as well as a small sealed storage hatch, which can come in handy for longer paddling trips. For everyday paddling, there’s a cup holder within easy reach inside the cockpit. There’s also a padded seat back that can be adjusted. As well as the handy storage areas, this yak is also built for durability and it’s pretty lightweight. Because it has a higher weight capacity than many children’s kayaks, the Aruba SS can be used by kids right up until they’re adults. If your kids are looking for a fun boat just like mom’s or dad’s yak then the Old Town Heron Junior could be the one for them. Built with kids in mind, this compact little vessel is ideal for family paddling trips. The Heron Junior is a 7 foot 5 inch long sit-inside boat that features a padded seat and seat back that is contoured to fit kids. 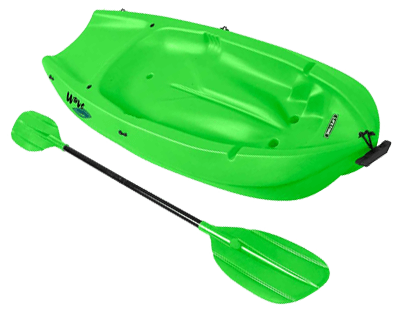 It’s built for efficiency and stability on the water and is durable, lightweight and easy for kids to maneuver. To add buoyancy, there are foam billets at both the bow and stern and for added convenience, there is a Tag Along Tow System built in, so you can easily tow your child if they get tired. This could be an ideal craft for smaller kids until they reach their teens or around 100 pounds. However, taller kids and teens may require a little more leg room. 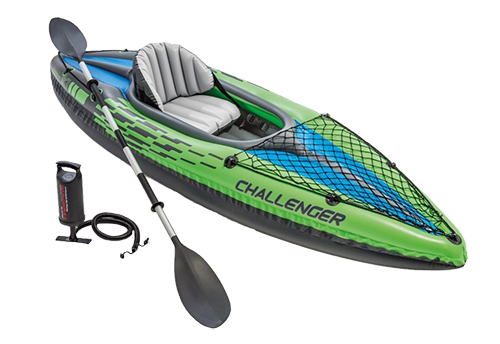 The Intex Challenger K1 kayak is an inflatable yak designed for recreational use for one person on lakes and rivers. It’s not specifically designed for children but could be a good option as an inexpensive starter yak for older or bigger children that they shouldn’t really outgrow. Because it can be deflated, it can be ideal for taking to the beach or on vacation, as it can be put in the trunk of your car quite easily. The kayak comes with a pump and a paddle, but for smaller kids, the 86 inch paddle may be a little too large. It features an inflatable seat for added comfort and benefits from grab lines at both the front and rear, which can easily be used to attach a tow rope if necessary. There’s also a cargo net on the front deck where your kids can store a jacket or small dry bag. Having your kids join you on your kayaking trip can be a really fun experience, especially when they’re in their own boat and can enjoy paddling. One of the most important things is that your child has their own PFD that they should wear at all times while they’re on the water. A small, stable yak can be ideal for kids as they can be easier to maneuver and more comfortable for them to paddle on their own. Bear in mind that your kids may not be able to paddle long distances, especially younger kids, so packing a tow rope can be essential for a happy day on the water. Think about the size of your child as well as their age, as size can be more of an indicator when it comes to choosing the right kayak for your kid. You don’t want to get one that is too large or one that they will soon outgrow. If you’ve found our guide useful, share it and encourage other parents to take their kids on the water. If you have want to share your experience of kayaking with kids, let us know.